Happy Spring Break!!! We just started spring break here and the kids are SOOOO excited! I was happy just to turn my alarms off this morning for the rest of the week! 🙂 My favorite alarm app is “Gentle Alarm” because it is very quiet and vibrates. The song gets louder and louder the longer it plays – plus it has a peaceful nature background each new day. 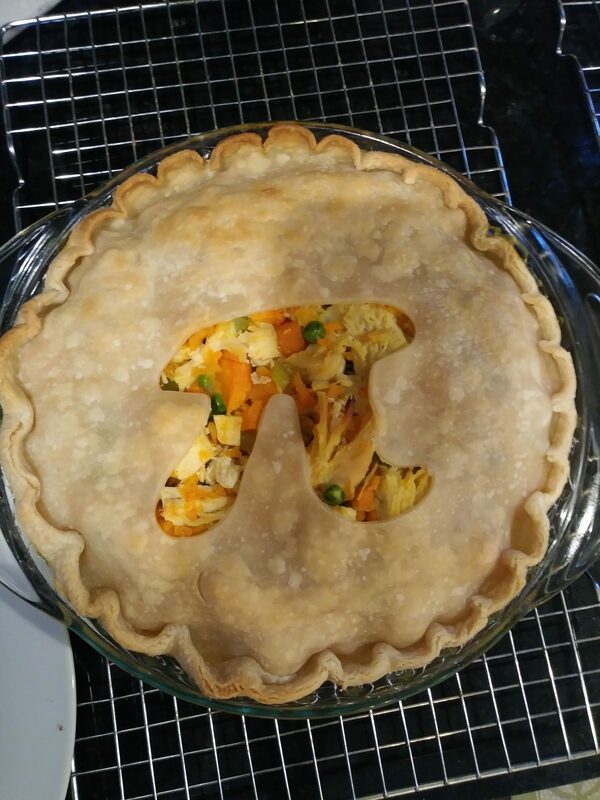 It has been a week since Pi Day and we have been testing out Pi Pie recipes. 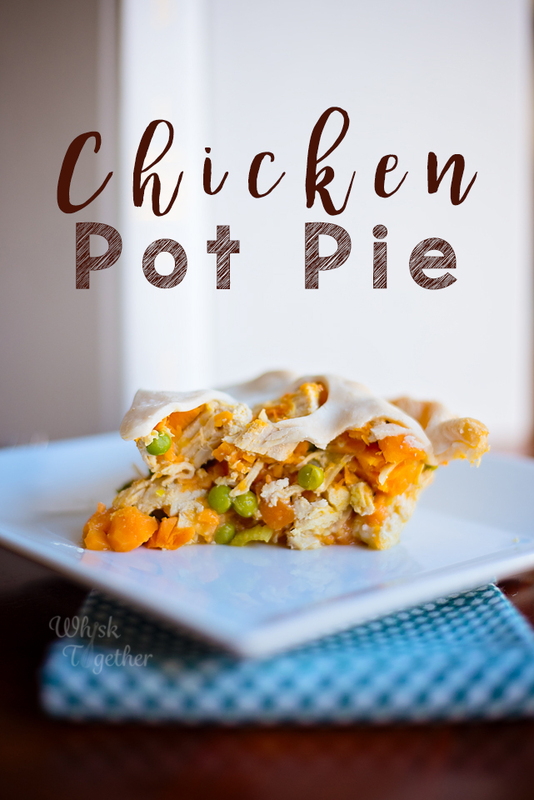 This new one is a twist on the chicken pot pie I grew up with Cream of Chicken and mixed vegetables. 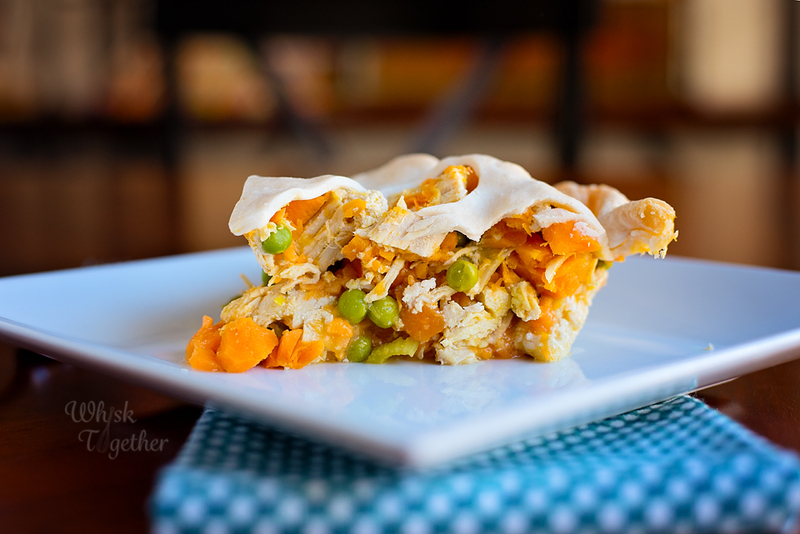 Here in this recipe you use only one pie crust instead of two and lots of healthy sweet potatoes. Instead of cream of chicken, a broth and cornstarch mixture is used to thicken the mixture before popping it into the oven. 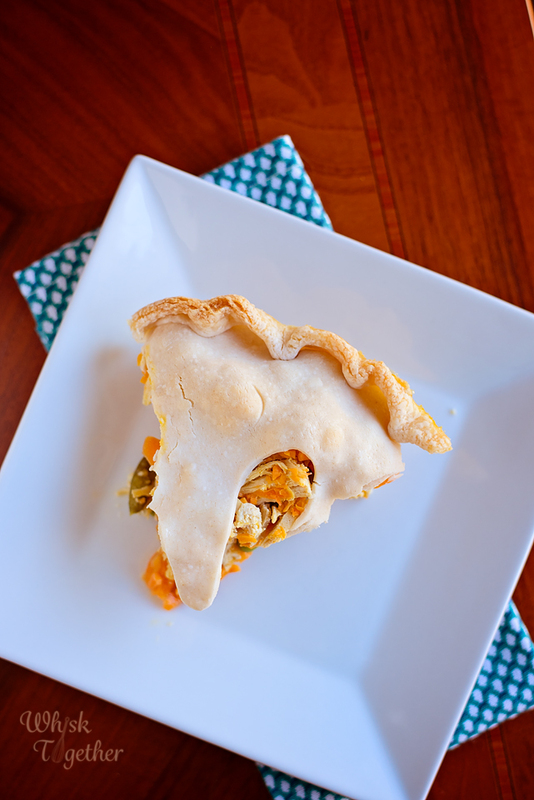 I hope enjoy this pie recipe or use it for inspiration on your own Pi Pies! I have started doubling all of our recipes since the kids are getting older and I went back to work. I made this one and made my normal pot pie with frozen mixed veggies, cornstarch and chicken broth with some garlic powder, 21 seasoning salute, salt and pepper. Yum yum! Or you can freeze them in the freezer for longer storage up to 3 months. Just be sure to keep them airtight with plastic wrap to avoid freezer burn. Interested in Pi? Head over to my other website mrsrileysclass.com and find more math info. For email users, click on the link to see the recipe! Preheat oven to 400 degrees. Spray a pie pan with cooking spray and place it on top of a rimmed cookie sheet to catch any drips. Shred or dice the cooked chicken into bite size pieces. You can cook the chicken in the oven, microwave, pot of water or Instant Pot. In a large pot, heat the butter over medium heat until melted. Add the onion, carrots, celery and sweet potato. Cook about 4-5 minutes or until vegetables are soft and tender. Add the garlic and dried thyme and cook 1 minute. In the measuring cup with the chicken broth, stir the cornstarch until mixed. Add the salt, pepper and chicken broth mix. Cook over medium to medium high heat until the mixture is simmering in order to thicken it. Add peas and cooked chicken. Stir until combined. Pour everything from the pot into the pie pan. Top with a pie crust or sheet of puff pastry. Add vent holes with a knife to let the steam out. Bake for 20-25 for pie crust. Bake 10-15 minutes for puff pastry. © Mary Ellen P. Riley. All images & content are copyright protected. Please do not use images or content without prior permission. Happy March Everyone! 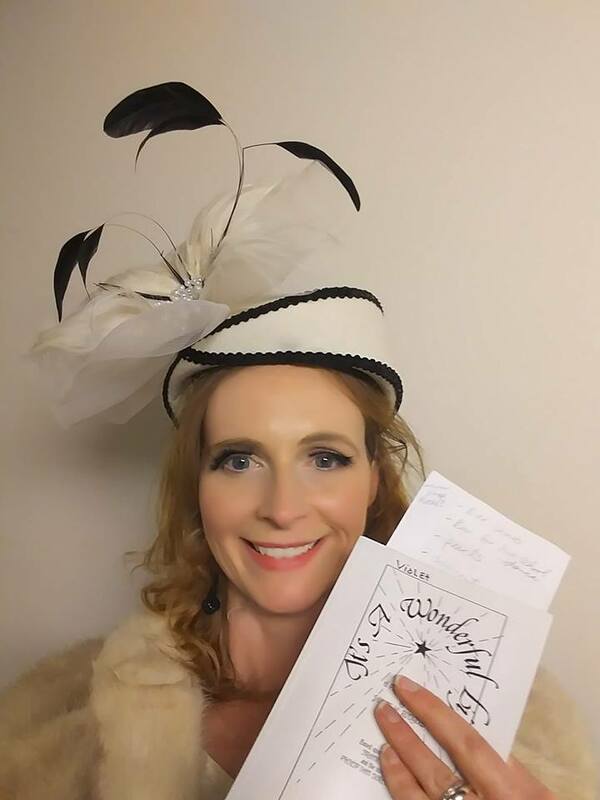 Pi Day – March 14th – was a fantastic day! I made my mom’s chicken pot pie recipe, a new chicken pot pie recipe and homemade cherry pie filling with the scraps leftover from the pot pies. We had a fantastic time! So soon it will be summer – some day – once we get past this winter and these 50 mph winds here in Missouri. Bathing suit season and all. Every year I go back to work I end up gaining 10 pounds. I’m not sure if it is the classroom that I stay in or the teacher lounge goodies… but it happens. As a result, I have been back on the Lose It! App and lost most of the weight already. In addition, I’ve been researching more scrumptious recipes to try and make lower in calories. I have to say that Flavcity is my new favorite for ideas. All of the recipes have been fabulous and I’m able to tweak them to make them my own without changing too much flavor or texture. Here is our new favorite so far with my take on the recipe. I buy a lot of groceries in bulk at Costco for the time and money… so my meats will be different because I get them in bulk there. You can always switch out the meat for whatever is closest to you (whether that be a local meat market…. or your deep freezer that is already packed with beef or venison). Kids and hubby all LOVED this one and I have to make double batches now! 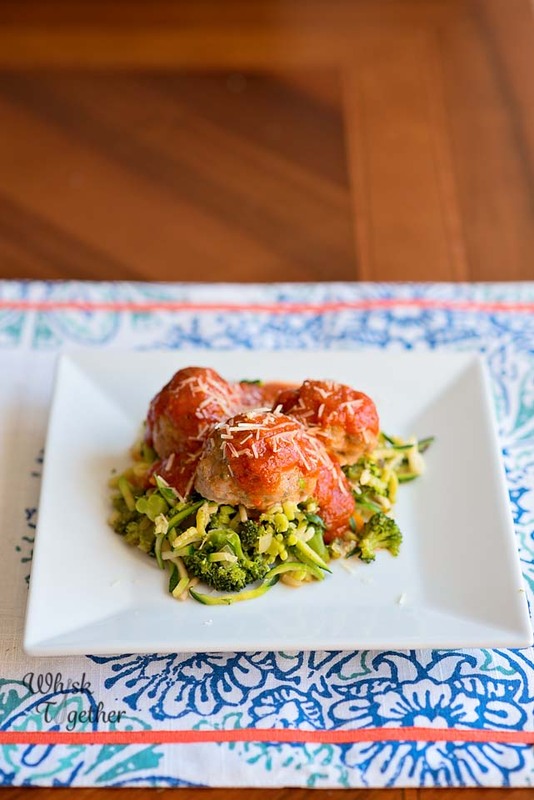 Feel free to just use part of the recipe – you could use the meatballs for meatball sandwiches, or the vegetable “noodles” for another side dish. Preheat oven to 350 degrees. Line a cookie sheet with foil or parchment for easy cleanup. Meatballs: In a great big bowl, mix the ground meat, garlic powder, onion powder, Italian parsley, thyme, oregano, eggs, cheese, salt and pepper. This mixes well with your hands. Using a large scoop, or your hands, scoop a golf ball size ball of meat. Round the meat with your hands and place on the cookie sheet. Repeat until the sheet is full. You would have about 20 meatballs. It is okay that they are close together. They don't expand in the oven. Noodles: In a large 12" skillet or cast iron skillet over medium heat, add the olive oil. If the broccoli is still frozen that is okay. Just put the lid on and cook it until it is thawed. If the broccoli is not frozen, add it to the skillet with the onion, pepper, thyme, oregano, zucchini noodles, salt and black pepper. Cook 8 minutes or until the onion is translucent. Stir once in a while. Add the garlic and cook another 1 minute. Remove the skillet from the heat. Add the lemon zest, Italian parsley and Parmesan cheese. Heat up the pasta sauce in the microwave or a pot on the stove until almost bubbly. Ladle the zucchini noodle medley onto your plate. Top with 3 meatballs and a scoop of pasta sauce. Top with extra Parmesan cheese and salt and pepper to taste. Snowmagedon 2019 is here!! We hardly ever get snow – now we have 12″ and some places of 20″!! This does not happen in St. Louis very often. Of course this means SOUP! I wanted a warm, healthy bowl of soup I could eat and eat and not feel guilty. 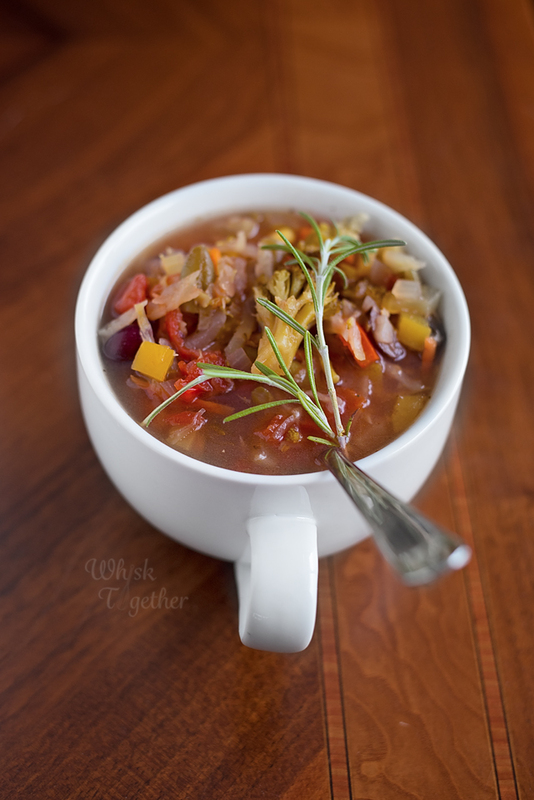 Here is your no guilt soup that can be easily modified for ZERO weight watcher points. I added beans for fiber and protein, but you could use edamame instead. I used a mixed vegetable frozen mix, but you could substitute green beans instead and again it would make this zero points for the soup. Serve with a grilled cheese, or Parmesan on top, or baguette or totally on its own or with a quick protein drink. I tried out 1st Phorm Caramel Latte and it is SOOOO good!!!! They even have Ice Cream Sandwich, Milk Chocolate and Vanilla Ice Cream flavors!!! I know I know protein drinks taste terrible. But I am a huge skeptic and it is actually good. I was even skeptical of the reviews because you know those can be faked and I think they are real because it is really that smooth and creamy. This soup makes a LOT so feel free to cut it in half or just eat it throughout the week like I did! Add garlic and cook 30 seconds. Add cabbage, red bell pepper, yellow bell pepper, frozen vegetables and mushrooms. Cook 5 minutes. Add broth, tomatoes, beans, and all of the spices/seasonings. Bring this to a boil and boil 5 minutes. Add broccoli and boil 3-5 minutes. Remove from heat and add lemon juice or vinegar, salt and pepper. Enjoy! I hope everyone had a safe and fun New Year’s Eve!!! 2018 was a pretty good year overall. I am still teaching 6th grade Gifted and Advanced Mathematics, the food blog is still running, I stopped doing paid photography, we are planning to go to Yellowstone National Park later this year, family is healthy and happy – so couldn’t ask for anything more! I have been re-making many of our family’s favorite recipes using the Instant Pot. I really do not seek out “new recipes” any longer, but re-make the meals we already love. Most of the recipes on this website have been cooked 3 or more times and revised so that they come out perfect every time – so that is why I use them most of the time. 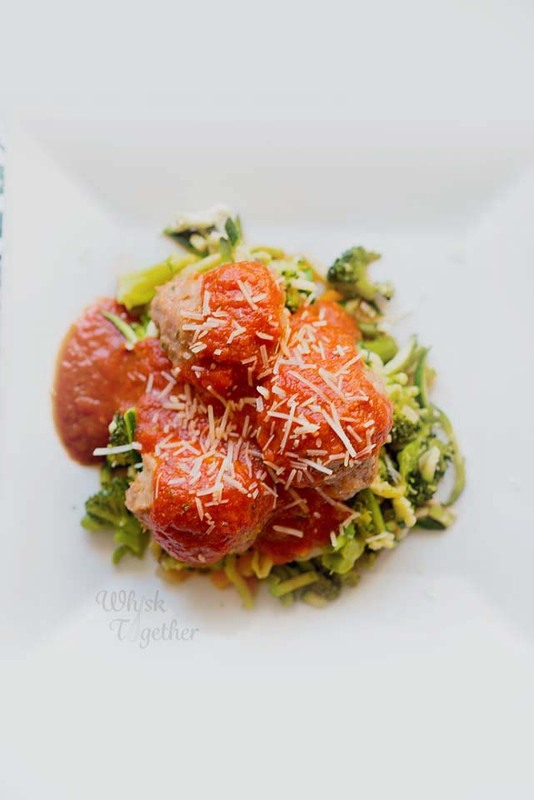 This recipe is an oldie but a goodie and I just knew the Instant Pot would cut the cooking time in half while keeping the flavors robust. I have had the Instant Pot for 5 years or so and really wish I had written a book or something before the device exploded in popularity! Select Saute on the Instant Pot and add olive oil. Once the oil is hot, add onion and peppers. Stir about 2-3 minutes or until translucent. Add minced garlic, spices (cumin, chili powder, garlic powder), and tomato paste and cook 30 seconds – stirring constantly. Turn Instant Pot off. Add the salt (optional), diced tomatoes and green chiles, chicken stock, beans and chicken breast. Put on the lid to “seal” and program for “Poultry” and increase time to 18 minutes for thick chicken breast or leave it at 15 minutes for smaller size. Use Quick Release once the Instant Pot is done cooking. Add the warm water and cornmeal. While the pot keeps the soup warm, shred the chicken with forks in the pot or remove and shred (you can shred it in the mixer too!). Serve with toppings and enjoy! Look! A recipe with NO pumpkin in it! Wild huh? Didn’t think that was possibly didja? Here’s my weekends so far: rehearsing for “It’s a Wonderful Life” the play and dinner theatre which is now SOLD OUT. 3 weeks until showtime! 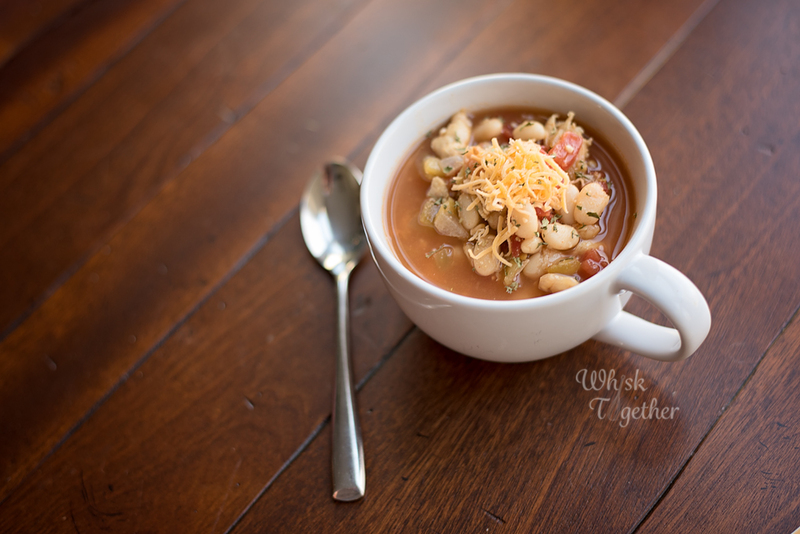 This is a soup I have been tweaking and making for many years now. It is now soup season since we have snow on the ground. I know many people love the Panera version and this does not look like their soup… but it does taste similar to their soup. It is still awesome tasting with a broth base of cooked onion, broccoli and cheddar. But not quite as lengthy in ingredients as their version which contains: Water, Milk, Broccoli, Cheddar Cheese ([Pasteurized Milk, Cheese Culture, Salt, Enzymes], Water, Sodium Phosphate, Milkfat, Salt, Apocarotenal [Color]), Heavy Cream, Carrots, Contains 2% or less of: Seasoning (Modified Corn Starch, Flour [Wheat Flour, Ascorbic Acid Added as Dough Conditioner, Niacin, Reduced Iron, Thiamine Mononitrate, Riboflavin, Folic Acid], Salt, Spices, Extractives of Paprika), Onions, Chicken Base (Chicken Meat and Chicken Juices, Salt, Hydrolyzed Soy and Corn Protein, Sugar, Flavoring, Potato Flour, Autolyzed Yeast Extract, Carrot Powder and Turmeric), Butter (Cream, Salt), Modified Food Starch, Soybean Oil, Dijon Mustard (Water, Vinegar, Mustard Seed, Salt, White Wine, Fruit Pectin, Citric Acid, Tartaric Acid, Sugar, Spice), Nisin Preparation and Hot Pepper Sauce (Vinegar, Red Pepper, Salt). You can make my original version. I prefer this one now since it easier to prepare and I almost always have these ingredients on hand to make a quick batch for the week’s lunches or dinner paired with homemade bread. In a large pot or Dutch oven, melt the butter over medium heat. Add the onion and allow to cook 3-4 minutes or until translucent. In the meantime, microwave your broccoli in a steam bowl or other microwave safe bowl. You may need to do this in two batches for about 4-5 minutes each. Depending on the strength of your microwave. This will thaw the broccoli. Add garlic to the cooked onion and stir for 30 seconds. Add the thawed broccoli, broth and water. Simmer. Cover with a lid and cook for 8 minutes or until broccoli is cooked through. Puree the soup using an immersion blender to get some chunks-some pureed soup. Or use your blender. Add the soup back to the pot and add the milk, cheddar and mustard. Stir until melted and soup is hot again. 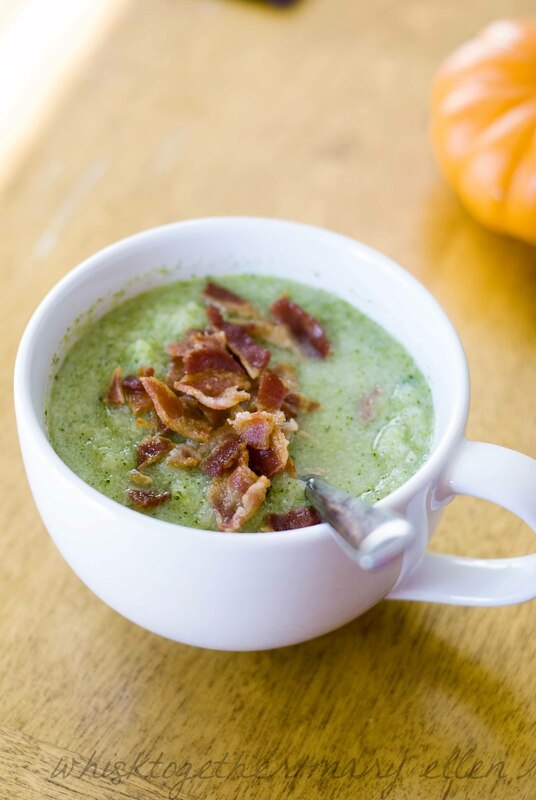 I like chunks in my soup so I do not blend it all – but that is up to you. Add cooked bacon if you would like to add some meat. Serve hot and enjoy! But hey, we are here for the recipes, not my opinion on the last presidential election that we missed on the blog. Whew! Maybe that’s a good thing we missed it…. The first section is about friendships, groups of friends and the roles friends play. Next, parents and parenting styles are discussed. Then, anger management and what to do about parties. Online communication and boys are included in the chapters as well. The book is lengthy… which is a blessing and a curse. 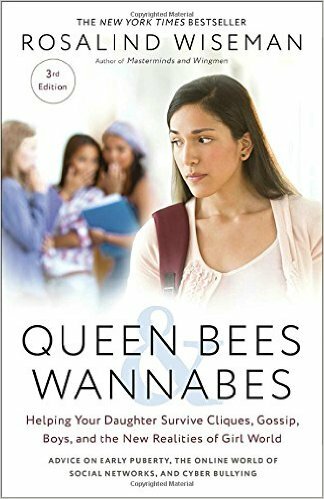 “Queen Bees and Wannabes” has so many scenarios that it will probably have what you are dealing with or what you will be dealing with in years to come. All 412 pages will not apply to everyone. But I can guarantee that some of this book will apply to all parents and help them – and their daughters – through whatever physical or emotional hurdles they may have to face and guide them through facing it together. I received a sample of this book to read from Blogging for books so i can give my honest and unbiased opinion/review. 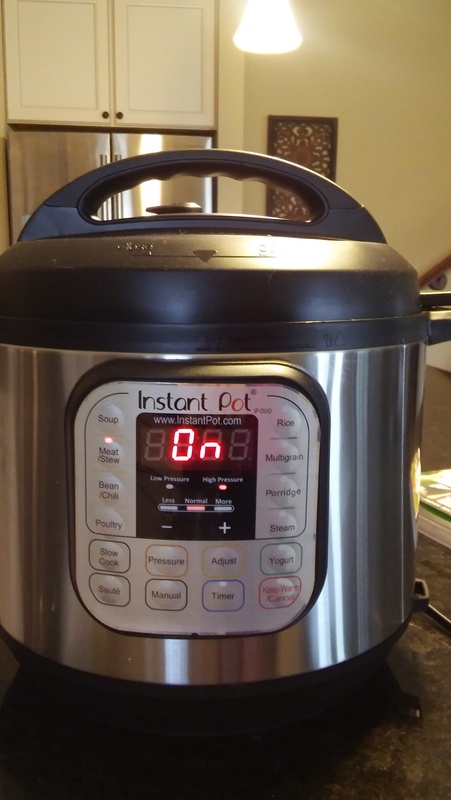 My Instant Pot is still my new favorite toy! 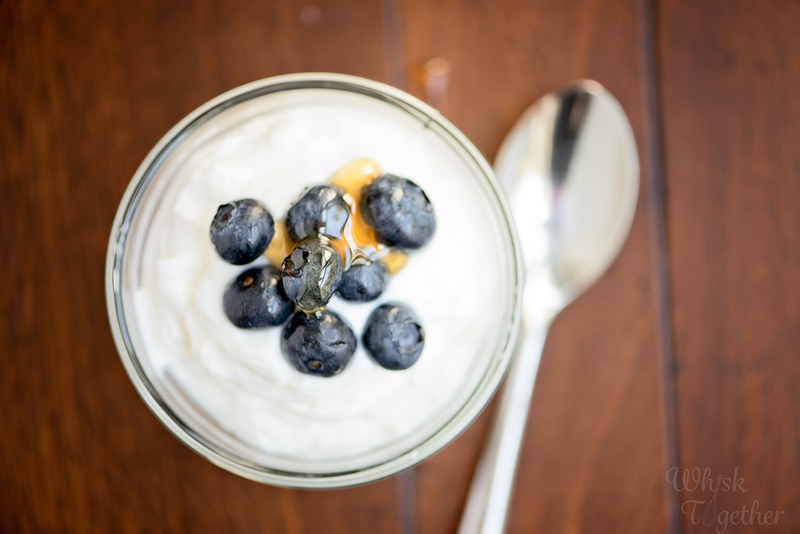 Check out this blog post with more things to do with the Instant Pot like: make yogurt from just milk, make a 10 hour roast in 1 hour, cook chicken without drying it out, make chili in 10 minutes, hard-boiled eggs where the shell comes off in one piece, make perfectly cooked brown or white rice. Now to the chili… we have tons of deer meat and been eating chili like crazy the past few months. 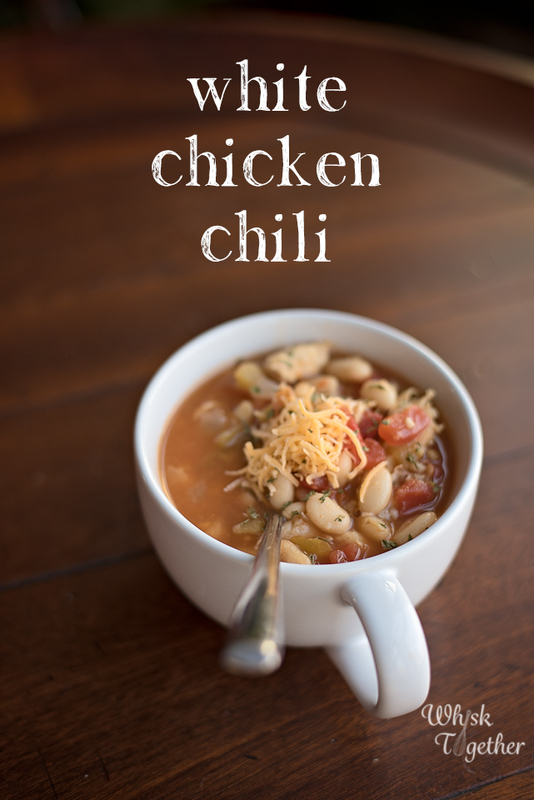 To shake things up a bit, I made white chicken chili. I have tried several ways and finally came across some ingredients that help a lot: Trader Joe’s fire roasted diced green chiles. YUM! Try to find them if you can. If not, that’s okay and find the Mexican food aisle in your store and they will have canned green chilies. *If you want to use dried beans – that works too! 1/2 cup dried beans = 1 can of beans. So, I used my Instant Pot the previous day to pressure cook the soaked beans. They were done in 12 minutes on high pressure using natural release. For regular pot: Heat olive oil in a Dutch oven over medium heat. Once hot, add the diced chicken and onion. Cook until no longer pink – about 8 minutes. Add garlic with the spices and cook 30 seconds. For Instant Pot: Turn on the Instant Pot to “Saute” on Normal/Medium. Add oil and once hot add the chicken and onion. Cook until no longer pink – about 7 minutes. Add the garlic and spices and cook those another 30 seconds. Turn Instant Pot off. Add the rest of the ingredients. Turn the Instant Pot back on to Manual mode and set for 10 minutes. Or press “Chili” and reduce the cooking time to 10 minutes. Make sure the vent is sealed of course! Release the pressure and your chili is finished! If you want it thicker, put the Instant Pot on saute with the lid off to reduce the chili. I have been working 50-60 hours per week between substitute teaching and photography while the hubby looks for a new job. 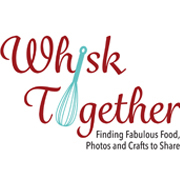 The cleaning and cooking still need done… so the blog was put on the back burner. Currently, I will be working toward applying for a full-time job when the new school year 2017-2018 opens up. I am still reading Ron Chernow’s Washington and it is STILL one of the best biographies. Which probably explains that little Pulitzer Prize that it won. The most recent tidbit I did not know is that Washington really wanted to go back to Mount Vernon and be home after the Revolutionary War. He was happy to help with the Constitutional Convention and get the new government on its feet. From his personal letters, it can be deduced that he only really expected to be president a couple of years. He was there to get the ball rolling so to speak. If Washington had known he was going to remain president for 8 years, he may never have volunteered in the first place. This recipe has a short story! So, about 6 months ago the kids and I discovered these delicious Chicken Melts at Costco. 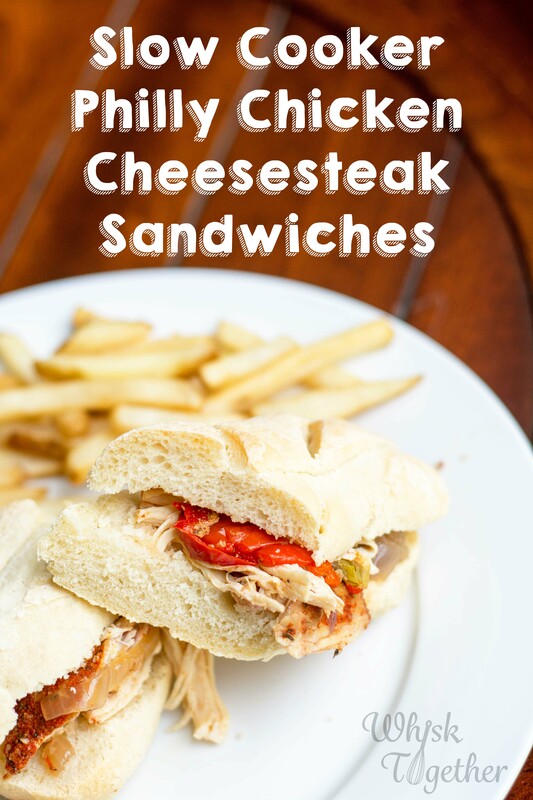 “Really….Really Tasty Sandwiches” is their motto and they are right! For the price and time, they are really good and really tasty. There are 15 chicken melts in one box and all 4 of us really like them. Plus, they are so tasty and low in calories that we want to eat one or two!! A box of 15 of them goes super fast! So – I decided to try and make a copycat recipe. It would taste almost exactly the same, but perhaps have more chicken so that it felt more like a meal than a snack. The kids gave them 4 thumbs up!! What do we do with this recipe?? You can freeze them like the Sandwich Bros. do! Just seal in plastic and reheat in the microwave (out of the plastic bag of course!). Start at 60 seconds per sandwich and wrap in a paper towel first with the cheese side UP. Or you will have a cheesy microwave! Eat them for lunch! The kids are in school and cannot heat up their own meal. So, I send the sandwich cold to school and they still love it. More like a deli type feel. Eat them for dinner! Yum! Have the fixin’s stashed in the fridge for any time. I make a large batch and then keep the chicken with cheese in a large container in the fridge. 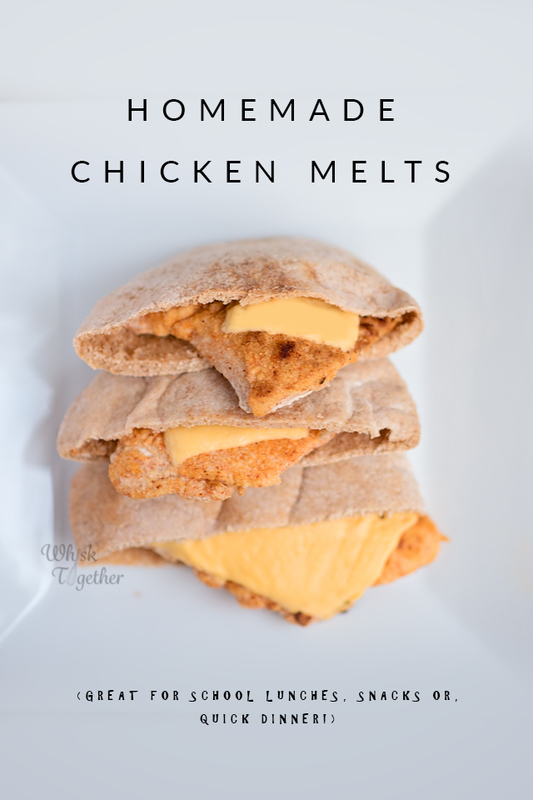 If someone wants to make a chicken melt, they just have to add the cooked chicken to the pita pocket. 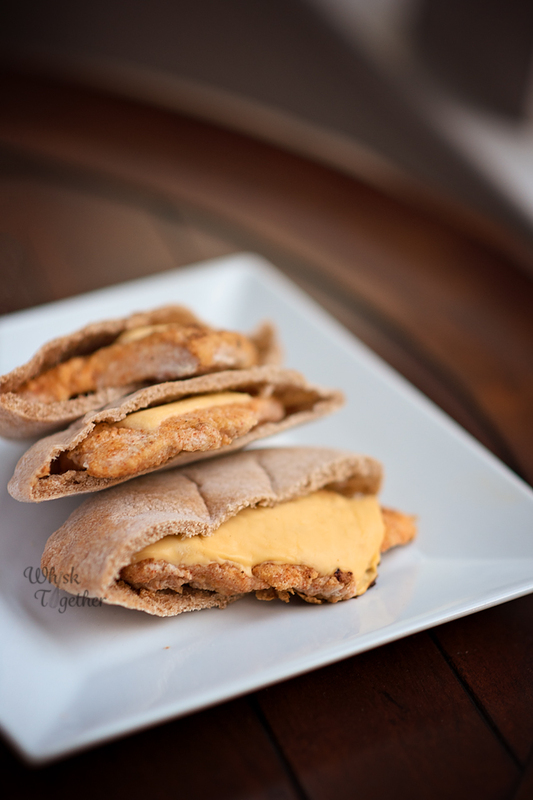 Here is a photo of the whole wheat pita pockets that I purchased for making the chicken melts. 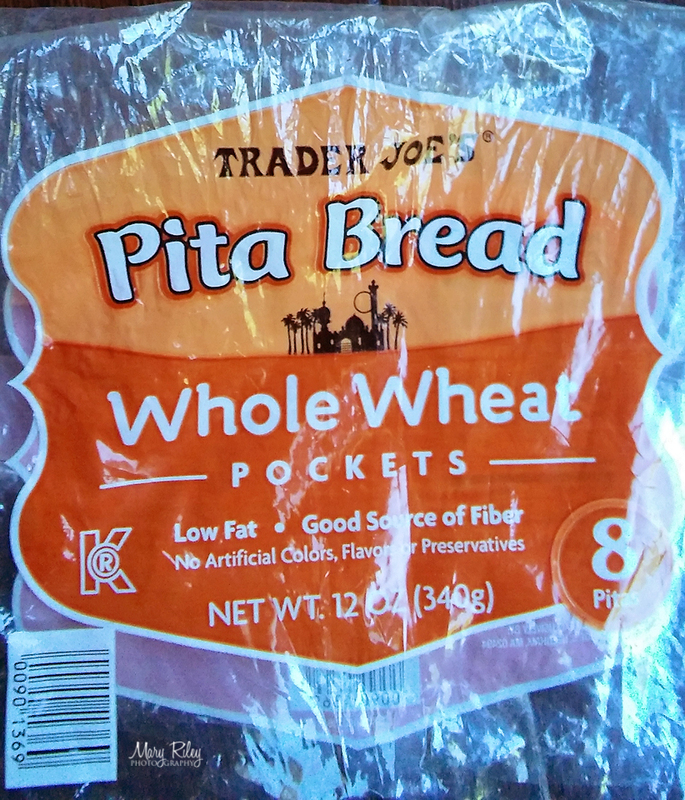 You can purchase pita pockets almost everywhere now! Since Trader Joe’s avoids preservatives and such, I try there first. **IMPORTANT** When opening up their pita pockets, heat them first a little. I store my bread in the fridge and the pockets would tear when I opened them up. BUT, they won’t tear if you heat them up for like 15 seconds in the microwave! 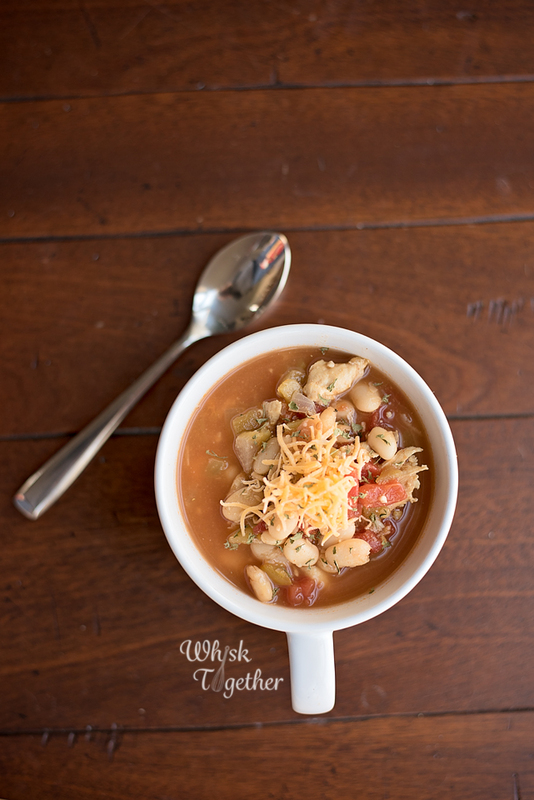 This recipe is a new staple in our household and I hope you enjoy it! To start, I heat up my large 12″ cast iron skillet on medium heat with a tablespoon of olive oil. I add more if it doesn’t cover the bottom of the skillet. While that heats up, slice the chicken in half LENGTHwise. You now have 8 chicken breasts. Now, cut those to fit you pita pocket. I cut mine in half again the other way to fit into the pita pocket. Now, I have 16 pieces of chicken. In a shallow bowl or baking dish, mix the flour, garlic powder, paprika, salt and pepper. Dredge each piece of chicken through the flour mixture on both sides until coated. Repeat on all the chicken. Add chicken to the skillet one layer at a time. Mine holds 4-5 pieces of chicken. Cook over medium heat for about 5 minutes. Flip. Cook another 3 minutes and make sure the chicken is cooking nicely. About 2 minutes before it is done, add the cheese. Melt the cheese for 2-3 minutes and remove the chicken from the skillet onto a wire cooling rack over paper towels. This will keep the chicken crispy on the bottom and the top. Repeat by adding a little more oil to the skillet if necessary and repeat with the remaining chicken. Heat up the pita pockets for about 15 seconds in the microwave. This will allow them to open easier. Slice the pita pocket circle in half to get two half circles. Fill the pita pocket with the cooked chicken and eat while hot! Or assemble and freeze in the freezer. To reheat from frozen, wrap in a paper towel and place in the microwave with the cheese side on top. Heat for 60 seconds and check to see if it is done. If not, add a few more seconds until heated thoroughly. Or keep separated in the fridge and assemble any time you are hungry. What’s so awesome about lentils? Lentils can be stored a long time because they are dried. 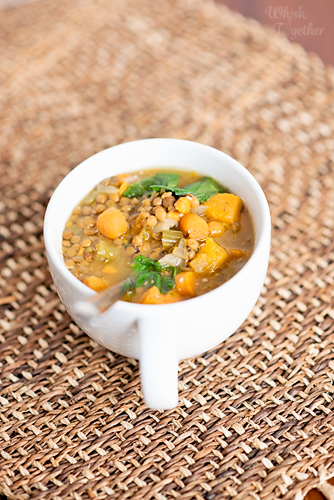 Lentils are a great source of potassium, calcium, niacin, zinc and Vitamin K.
Lentils are rich in fiber and lean protein. 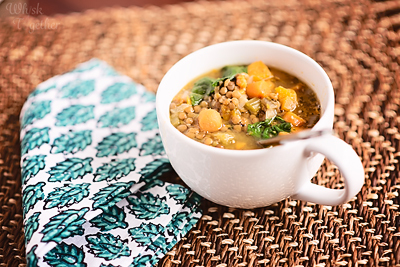 Lentils are like chicken… they take on the flavor of whatever ingredients they are cooked with. 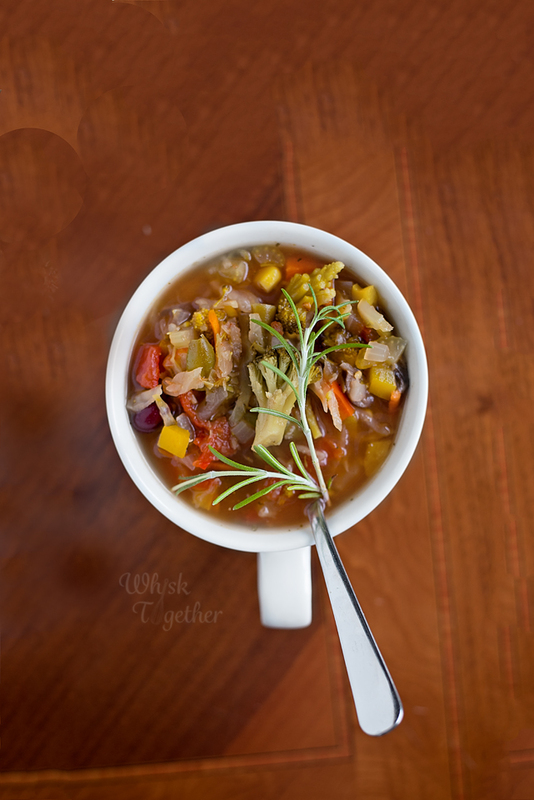 This soup is great for those of you trying to lose weight! Lots of protein, fiber and veggies. Or trying to maintain weight. Or just need a nice warm bowl of soup. It is a nice blank canvas for anything you would like to add to it. Parmesan cheese, lemon zest, lemon infused grapeseed or olive oil, red wine vinegar, etc. all taste great as a finishing touch. 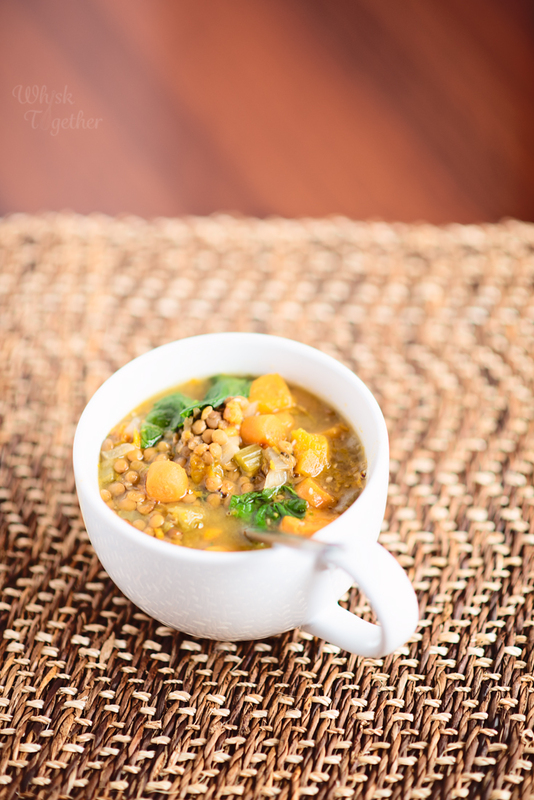 If you are trying to add a “Meatless Monday” to the dinner menu, this soup would definitely fit the bill! Simply add a side salad or whole grain bread. To keep the week going smoothly, I try to get a few things done on Sunday. One of those is making a big batch of soup and one large bowl of salad. That way I always have something to grab for lunch or a back up for dinner. Especially since these soups and most of my salads don’t contain meat or dairy mixed in, then I don’t feel like it is going to turn bad in 6-7 days. Into a large slow cooker, add all of the ingredients from butternut squash through ground pepper. Cook on high 4-5 hours or low for 6-7 hours. Add baby spinach and squeeze lemon juice into soup. Allow to wilt about 5 minutes. Salt and pepper to taste! I added quite a bit of salt and pepper. I also added Trader Joe’s 21 Seasoning Salute because it tastes great on everything. Add 1-2 cups of additional broth for a thinner soup. I like my soups on the thick side. Okay, I should call these “Quick Baguettes” because true French baguettes require a very long overnight rise time. If you have that kind of time, here is a good French Baguette recipe. Great for sandwiches, side dishes and soups! As for me and my house…. we will be making fast baguettes. 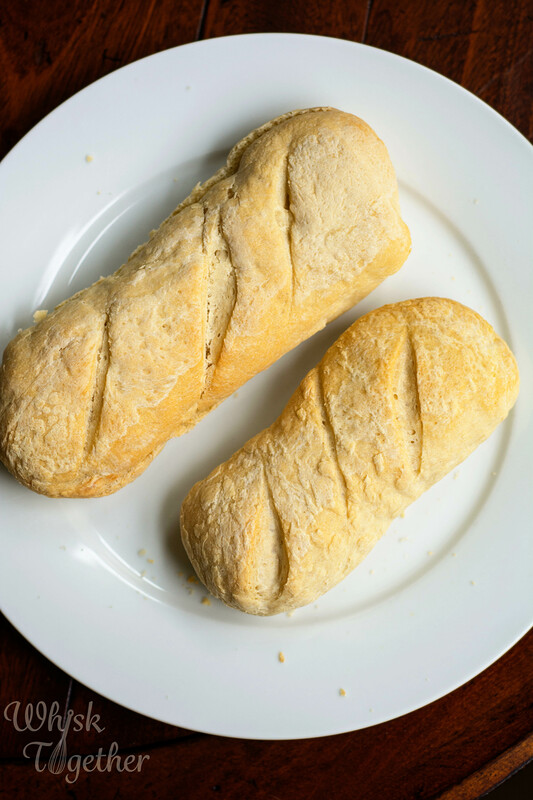 🙂 These are super delicious and super easy – especially when you have a bread machine. You can make them without a bread machine as well! 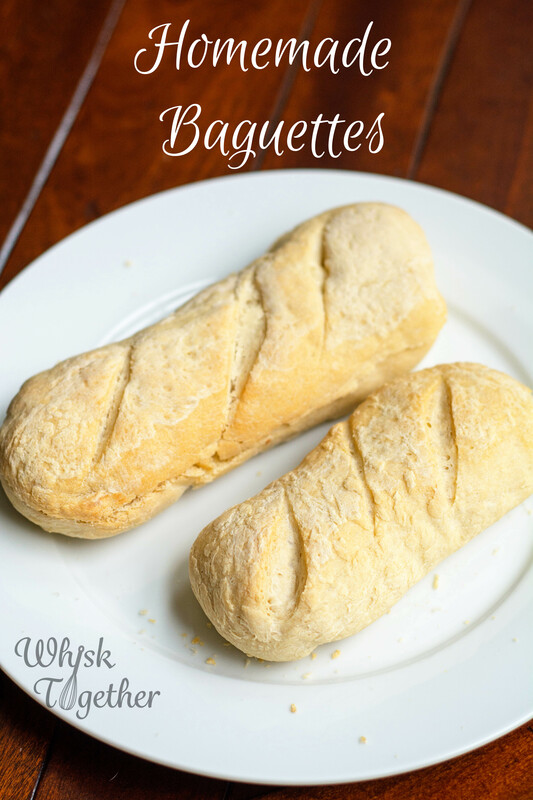 The kids and hubby LOVED these baguettes. They didn’t have a super hard crust on them like some baguettes do. They were nice and soft and chewy. Plus…. there is the fact that all-purpose flour tastes like CANDY after eating 100% whole wheat for the past 7 years. Why make your own? There are only 4 ingredients. No preservatives, no caramel color, no polysorbate 60, no anything but flour, water, yeast and salt. If you have those things in your pantry, then you CAN make these. This is a great yeast recipe to start out on. 1. Preheat the oven 25 degrees higher than baking temperature. This is because once you open the oven, it will reduce in temperature anyway. Preheating higher allows for more initial “spring” in the baking process. 2. Test your yeast if you aren’t 100% positive it is alive. It is a bummer to wait 2 hours and find out right before dinner that the yeast was dead. To test the yeast, I use active dry yeast. I add the yeast, water and a little bit of sugar if the recipe calls for no sugar. If the recipe does call for sugar, like a pizza dough, then simply add the sugary substance to the water and yeast. After 5 minutes, you should see a little foam on top telling you the yeast is burping carbon dioxide and alive! 3. Weigh your flour. On a scale. And pay attention to the author of the recipe. King Arthur Flour thinks that AP flour weighs 4.25 ounces per cup and scales their recipes based on that. America’s Test Kitchen think s that AP flour weighs 5 ounces per cup. Most places and most recipes will yield 5 ounces per cup of all purpose flour. King Arthur Flour weighs and scoops their flour differently. 4. For a shiny crust, brush a mixture of 1 egg and 1 Tb. of water on top before baking. It will be a little crisper, too. 5. Pay attention to the bread more than the time! Sometimes bread can get a little crazy and proof too fast. Just look at it once in a while. 6. I like active dry yeast. I’m not patient and neither is this yeast. It is fast and great for bread machines or bread that you need made in 2 hours or less. Ok, really…. The reason I made my own baguettes is because I was too lazy to go to the store and buy sandwich bread for the Slow Cooker Chicken Philly Cheesesteak Sandwiches. For bread machine: Throw everything into the machine per the machine’s directions and hit “dough cycle”. Shape the resulting dough into 2 or 4 logs. Make shallow diagonal slashes on the top. Cover with plastic and preheat the oven to 400. Once up to temperature – reduce the oven to 375 degrees and bake the bread for 15-25 minutes. For by hand: Add yeast to the water and let sit for 5 minutes. I would recommend adding a pinch of sugar too if you are not sure that the yeast is alive. If bubbles form on the surface because they ate the sugar, the yeast is alive. Add flour and salt. Mix together by hand or in a mixer with the paddle attachment. When combined, switch to a dough hook and knead for 5 minutes. (or knead by hand for 8-10 minutes). Place dough in a greased bowl. Cover with plastic wrap. Rise 1 hour or until doubled. Punch down the dough and break into 2 or 4 pieces. Roll into a log about 6″ long for 4 baguettes. Use a serrated knife to slash 2 to 4 shallow slices on the top diagonally. Place baguettes on a cookie sheet covered with parchment or silicone. Or on a baking stone. Cover back up with plastic wrap and rise another 20-30 minutes. Preheat oven to 400 degrees while the bread rises. Remove the plastic wrap and REDUCE THE OVEN to 375 degrees. Bake for 15-25 minutes (depending on if you made 4 small ones or 2 big ones). *If the dough is not coming together, add a little more flour. [br][br]*For a pretty and shiny crust, brush the top right before baking with a mixture of 1 beaten egg and 1 Tb. water. I made these on homemade baguettes. That recipe will be next! Why homemade baguettes? Because I’m too lazy to run to the store when I can dump the ingredients into my bread machine. These sandwiches are awesome and you DON’T need to make your own baguettes! You DO need to make these sandwiches. Please, pretty please. They are delicious, and easy and great for leftovers. Add the chicken to soup, or a tortilla or keep making sandwiches! Freeze the contents and always have sandwich fixin’s on hand. This recipe will easily feed a crowd as well – just increase the cooking time and add more of everything. Slow cookers are great to serve from since they keep things hot. Serve with fries, slaw, chips, veggie sticks, salad or with a soup. Add the peppers and onion to the slow cooker. Sprinkle half of the spice mixture on top. Add the chicken onto the peppers and onion. Sprinkle the rest of the spices on top. Pour the water or broth into the slow cooker on the side so that the spices don’t come off the chicken. Cook chicken breasts for 3-4 hours on low. Cook chicken thighs for 4-5 hours on low. Towards the end of cooking time, slice the buns or baguette in half lengthwise. Shred the chicken in the slow cooker with some tongs and place on top of the bun. Add cheese. Top with a bun, or broil it with the cheese and then place the top on.